Hi Guys. My name is Ryan Tendonge and I’ve been having some issues trying to test the work that was done in the Gsoc 2018 Password Reset project. I have tried setting up my system in a couple of ways. First I set up a new Reference application, version 2.8.1 using the openmrs SDK, but I was advised to set up an Openmrs Platform instead, version 2.2.0-beta(which is the latest version). After configuring my system as specified here( and running the test specified), I got the error specified in the screenshot below. I then tried to set my system up using jetty. I cloned openmrs-core from github, ran mvn clean install then I navigated to the webapp folder of the repo and ran mvn jetty:run. I still could not get the Password Reset test to work. Am I doing something wrong? Can you share the full server side error log at pastebin.com? From where we left at uberconference, can you list the exact steps one by one, that i need to continue with, in order to reproduce the problem that you are facing? 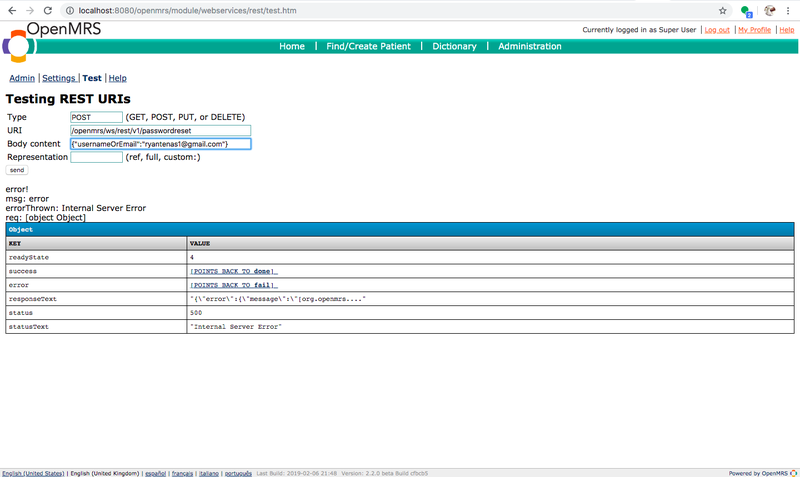 @dkayiwa So where we ended was after I created the new platform server, loaded the legacy ui and the rest web services omod files, then restarted. After that we ran the test for password reset and it showed a success( which turns out was just a formality). Can you take me through this on uberconference? That is from where we left, where it is working, up to the point where you configure and get the error. Yes I can. Sorry I am only seeing this now. Any chance we could go through this in the morning? What time works for you? Ping me publicly on IRC whenever you are ready. Hi @dkayiwa, did you have any luck testing the stuff I pointed out during our previous call? @harisu did you get a chance to look into this? @dkayiwa Were you able to reproduce the error? Well getting a success when there was no email that exists in the system is deliberate as it was meant such that on a post request just return a success rather than give you a clue on whether the user exists or not so you don’t need to continue brute forces with other users(if that was the intentions) so typically what will happen is when that success is received you tell the user to check their email. As for why it fails for you when there is an email I really need to verify further. I can’t reproduce This error. Are you available for debugging? in like an hours time?